Thomas à Kempis was born in the German town of Kempen in 1380. He spent most of his life near the city of Zwolle in Holland, because of that he is placed in this section "Famous Dutch people", although he wasn't Dutch from origin. 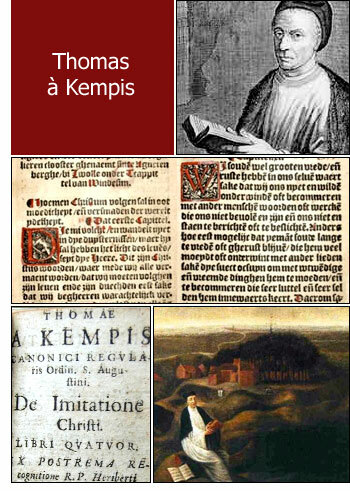 Thomas à Kempis was a medieval Christian monk and became well known around the world because of his work "de Imitatio Christi" (imitation of Christ), a book on Christian devotion, after the Holy Bible the most translated and sold book in the world. Thomas à Kempis' real name was Thomas Hämerken or Hermerken, which means "little hammer" in Old Dutch and German. In 1395 Thomas à Kempis was sent to the city of Deventer, about 20 miles to the south of Zwolle, where he attended a school conducted by the Brethren of the Common Life, a religious community founded in the 14th century by Geert Groote. Lateron his life he was admitted to the Augustinian convent, the "priorij van Sint-Agnietenberg" (the priory of Mount Saint Agnes) near the city of Zwolle, where he received his priest's orders in 1413 and was made subprior in 1429. All his writings are of a devotional nature and almost all of them were written in the Latin language. His works consists of tracts and meditations, letters and biographies of Geert Groote, Radewijns, and nine of their companions. A famous quote from "de Imitatio Christi" is "Sic transit gloria mundi", meaning "Thus the glory of the world passes away" or "Oh, how swiftly the glory of the world passes away". Thomas à Kempis nearly stayed all his life at the monastery of Mount St. Agnes, where he died in 1471 at the age of 91. The relics of Thomas à Kempis are placed in the Onze Lieve Vrouwe ten Hemelopneming-basilica (Our Lady Ascension basilica) in Zwolle.